Batman and I don’t have the greatest relationship. I first realized how tiring I found Bruce Wayne’s absolute ideals when I played Batman Arkham Origins, where he saved his nemesis, the Joker, from a fatal fall, despite the clown having caused chaos and destruction around Gotham City. The Joker’s actions are the cause of all the pain and suffering that followed in Arkham Asylum and Arkham City, and had Batman let the villain die at that moment, countless lives would have been saved and many hardships avoided. But Batman doesn’t kill, and he believes it’s his duty to save as many lives as he believes possible, including criminals who intend to harm the people he claims to protect. Having seen the events in the other Arkham games that followed saving the Joker, I felt a frustration finally manifest within me regarding Batman’s philosophy on the subject of killing. This goes beyond my feelings on the character, but stretches out to a larger issue within comic books and comic-based media I’m otherwise a fan of. Questioning the morality of killing a villain is deeply ingrained in superhero stories, DC’s especially, with several of its heroes claiming that killing a criminal makes one no better than the one committing the crime. Because of my frustration with the seemingly black and white take on the subject, I was glad to see Injustice turning its heroes’ morality on its head. The fighting games have been one of DC’s more interesting takes on the subject, as it uses alternate realities to explore how this philosophical conflict could divide its roster of heroes, rather than having them all continue to operate under this status quo. In a universe where Superman kills the Joker after being tricked into killing his wife and child, the Man of Steel has been swayed away from Batman’s mindset, creating a regime under his rule. There is peace, but Superman’s rule is so absolute he has become a dictator and the world has become unrecognizable compared to most of the established DC canon. This new world opens up new possibilities, and the circumstances challenge characters in ways that a more straightforward DC story doesn’t. Robin sides with Superman in his regime after growing tired of seeing villains escape imprisonment and continue to hurt innocents. Harley Quinn becomes a hero when outside the influence of the Joker. I was hoping that Batman would start to question his own ironclad code as the series progressed, or at the very least that there would be a point where someone could challenge his ideology and win, proving to him all along that these absolutes don’t always hold true. As it turns out, Injustice 2 leads up pretty nicely to a conflict where I thought I’d able to try and sway Batman over to my view point. At least, that was my hope. The final hour of Injustice 2’s story mode let me choose between supporting Superman’s decision to execute Brainiac, an alien invader who causes unspeakable havoc on Earth, or side with Batman and spare him. As this decision was laid before me, I heard rational reasoning from Superman’s side, with characters like Wonder Woman and Aquaman offering up counterarguments to Batman’s principles. Brainiac is a risk to the citizens the heroes are trying to protect, and they’d seen with villains like the Joker what happens when they continue to insist on sparing them, regardless of the crime. Injustice 2 offers up a morality on the idea of execution that could have been more gray than most of DC’s properties, and I hoped that Batman, a face of this ideology, could be won over to that side, just as Harley was won over to Batman’s aid or Wonder Woman came to decide that some lives should be taken. But even when I sided with Superman and fought Batman in order to ensure Brainiac would be executed, as I felt he deserved, Batman isn’t won over to any side. Instead, he’s turned into a mind-controlled slave to Superman. In the face of so much character development within the Injustice series, Batman’s role feels static. By focusing on an alternate universe that spits in the face of some of the most ingrained beliefs of DC’s body of work, Injustice is a story that can, and in several cases does, break through the barriers of what we’ve expected of many of these classic characters for decades. But for Bruce Wayne, Injustice is easy—it doesn’t ask anything of him. He merely has to exist as a foil and obstacle for everyone else, standing steadfast in a world whose reality has changed before him. And ultimately, he’s supported regardless. When I side with Batman, Brainiac is spared and imprisoned, but the possibility he could escape and do more harm lingers over the world. If I side with Superman, Injustice 2 takes a dark turn where Batman’s viewpoint is silenced, rather than actually confronted, argued against and even changed. 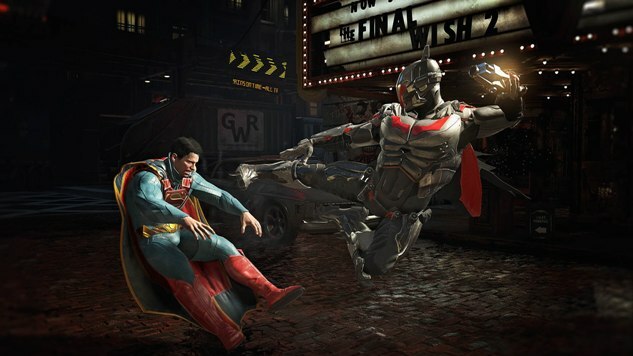 Injustice 2’s final decision may have let me support Superman, but it didn’t do for Batman what the series has done for so well for so many others: challenge these people’s worldviews in ways that allowed them to be different and perhaps more impactful than they’ve ever been before. Kenneth Shepard is a Georgia-based freelancer who cries about videogame characters in public places and on Twitter @shepardcdr. Along with Paste, you can find his work at GamesRadar+ and CGMagazine.